As the little white ball glides across the pristine turf at Underhill Field, the anticipation in the air is palpable. Spectators begin to stand, and their eyes are focused down the field on one person: Megan Rodgers. The ball hits Rodgers’ stick, and as she turns to face the goal, just one opposing player separates her from the goalie. It’s just a few seconds, but time seems to slow down as Rodgers makes her move. She deftly guides the ball forward, and as she enters the shooting circle, the field grows quiet. With the defender on her hip, Rodgers stops, turns around and unleashes a reverse shot that goes between the goalie’s legs and into the back of the net. The goal is Rodgers’ third of the day in Cal’s season opener against Providence, marking her second collegiate hat trick in a career that seems destined for many more. Sights like this have become common for Rodgers, the star sophomore forward who has already put her name in the Cal field hockey record books. Rodgers’ journey to this point, though, begins nearly 500 miles south of Berkeley in San Diego, where she was raised in a sports-loving home. For Rodgers, field hockey is a family matter. As the youngest of three girls, Rodgers picked up the game in elementary school after learning from her older sisters, Kristin, who played field hockey at UC Davis, and Racquel, who played soccer at San Diego State. It wasn’t long until Rodgers was dominating on the same field she used to visit as a spectator and postgame star. And while she’s risen up from backyards and high school fields to Cal and the USA junior national team, her roots still belong at home. Once Kristin graduated from high school, it was Megan’s turn to take center stage. After the traditional freshman season on the junior varsity team, she began to wreak havoc on opposing defenses throughout the San Diego area. Rodgers led the nation in 2015, her junior season, with 60 goals en route to a state championship. The next year, she one-upped herself, scoring three goals per game while compiling an eye-popping 81 on the season, the second-most in the nation’s history in a single season. Rodgers’ scoring prowess, too, is rooted in family. Before the Rodgers clan became a field hockey family, they were a soccer household, and Rodgers’ passion for scoring was born from her time as a soccer star. Even with her consistency in generating goals — she scored in all but one game as a senior — her on-field wizardry never failed to amaze her coaches. But before all of the accolades and championships in high school, Rodgers was just another promising player seeking to put herself on the map. In middle school, Rodgers attended a camp at Cal, and Onstead saw a bright future in the young forward. And as Onstead got a closer look at Rodgers early in high school, she saw that innate ability blossom into unique talent. Beyond just the talent, though, Onstead was captivated by Rodgers’ drive and demeanor. After being selected for USA Field Hockey’s youth Futures Program, Rodgers was drawn to the high level of competition and continued to pursue opportunities on the U17 and U19 national teams. And now, two years into the Megan Rodgers era, the star forward has lived up to the hype. In her freshman year, she posted 17 goals in 17 games, good for third among all freshman in the nation. This season, she experienced a bit of a “sophomore slump” — if you can even call it that. Rodgers put the ball in the back of the net 13 times and added four assists. And in a tumultuous 5-12 season for the Bears this year, Rodgers was the lifeline. She produced more than 40 percent of Cal’s shots and scores this season and delivered two game-winning goals. Cleat and Rodgers came in together as freshmen and grew close during their first year on the team. The two now share a room that they endearingly call “super-king,” as their beds are so close together that they form a massive mattress. 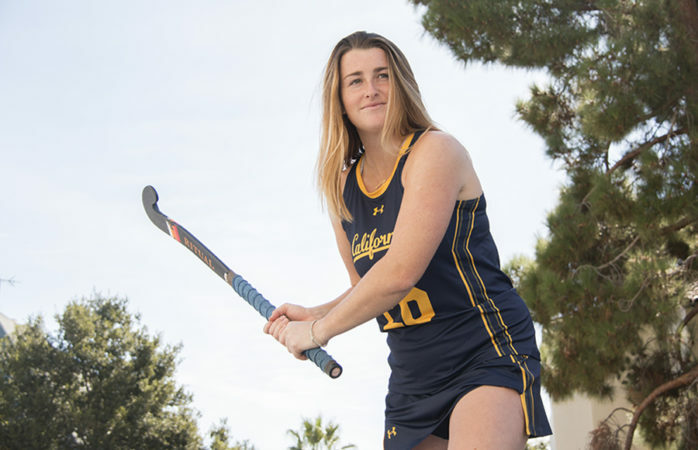 Now, halfway through her college career, Rodgers is already among the Cal field hockey greats. She is in Cal’s top 10 in both single-season and career goals and needs just 16 more goals to become the second-leading scorer in program history. While Rodgers has already made her mark, the best may be yet to come. She injured her foot last spring, which kept her out of typical summer training sessions, and she had to work hard to get back in shape for the season. This time around, Rodgers is set for postseason training with her coaches in preparation for national team selection camps in December and January. With this additional training and next summer’s practices, Rodgers is set to enter her junior season in full force. Tim Sun covers field hockey. Contact him at tsun@dailycal.org.